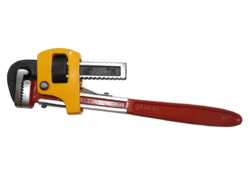 We offer Pipe Wrench Stillson Type. Drop Forged,Carbon Steel & Hardened Teeth. Forged steel Hardened Jaws/ handle and strong flat links chain is mostly used in trench for all types of pipe fitting jobs,from oil field to general work. Size Range For Hss Hand Taps--Imperial:1/16"-4",Metric:1 mm-120 mm. Size Range For Round Dies-Imperial:13/16"Od-4"Od,Metric:16mm-100 mm.